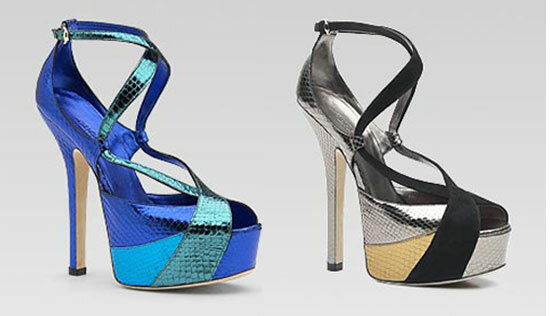 Right: Black suede with gunmetal dark gold lamé python with goldtone hardware. Horsebit ring buckle. Slingback; platform sole. 3 1/4″ mid heel. Made in Italy. Patent leather heart-shaped peep-toe pump. 130mm/5 inch heel with 20mm/1 inch platform.